I have an abiding philosophy that sometimes the universe provides. Anyway. In this case, I got a phone call at my TV station from a woman who said she had a story for me. Now, I get a million of those calls a day—well, not that many, but many—and I try to listen to them all as much as I can. Who knows when it may be the story of the century. It could happen. So this woman tells me a friend of hers had spent the past ten years searching, unsuccessfully, for her birth mother. And finally, it seemed she’d found her. The adoption agency had called to say the birth mother had decided to let herself be known, and as a result, the agency called the daughter and set up a reunion. But then, the caller said, everything began to fall apart. The “mother” and “daughter” met—they liked each other fine, and had a cup of tea. But as they chatted, things just didn’t add up. Dates, times, cities, birthdays. And finally, the caller said, they realized the agency had sent the mother the wrong girl. I still remember the goose bumps I got when she said that. But I was instantly transported to the world of adoption and foster care and the love of mothers and daughters—and the heartbreaking decisions that sometimes have to be made. And, I thought: What if an adoption agency was reuniting birth parents with the wrong children? On purpose? Could that happen? Whoa. And in that instant—I had THE WRONG GIRL. All of us crave family—it’s our identity and our history and our story. For a person searching for her birth parent—do they really want to know? What if they don’t like them? What if the answers they find are unsettling? What if you were happier—before? Or—and I’m smiling now—what if you get linked up with the wrong person? And what if someone deliberately lied about it? Would you know? How? And what would you do? What if you didn’t know the truth about your own family? Again, did I know the answers when I started writing THE WRONG GIRL? Who, what, when ,where why? Nope, not at all. But it was terrific fun and a constant surprise to find out. It was a lot of research, and a lot of thought, and a lot of listening. I learned about worlds I could never have understood before. And I am very grateful. And what about you, Friends of the Fabulous Kaye? Have you faced the complications and conflicts and complications of searching for a birth parent or child? I would love to hear...and leave a comment of any kind to be entered to win THE OTHER WOMAN, the Mary Higgins Clark award wining first Jane Ryland book! HANK PHILLIPPI RYAN is the on-air investigative reporter for Boston’s NBC affiliate. She’s won 30 EMMYs, 12 Edward R. Murrow awards and dozens of other honors for her ground-breaking journalism. A bestselling author of six mystery novels, Ryan has won multiple prestigious awards for her crime fiction: the Agatha, Anthony, Macavity, and most recently, for THE OTHER WOMAN, the coveted Mary Higgins Clark Award. National reviews call her a "master at crafting suspenseful mysteries" and "a superb and gifted storyteller." Her newest thriller, THE WRONG GIRL, is dubbed "Another winner" in the Booklist starred review. She’s on the national board of directors of Mystery Writers of America and currently president of national Sisters in Crime. Does a respected adoption agency have a frightening secret? Tipped off by a determined ex-colleague on a desperate quest to find her birth mother, Boston newspaper reporter Jane Ryland begins to suspect that the agency is engaging in the ultimate betrayal--are they reuniting birth parents with the wrong children? For detective Jake Brogan, a young woman’s brutal murder seems a sadly predictable case of domestic violence, one that results in two toddlers being shuttled into the foster care system. Then Jake finds an empty cradle at the murder scene. Where is the baby who should have been sleeping there? 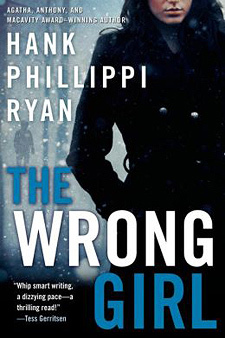 THE WRONG GIRL is a riveting novel of family connections—both known and unknown—vile greed, senseless murder, and the ultimate in deception. What if you didn’t know the truth about your own family? Hank Phillippi Ryan - Welcome back, my friend!!!!!! I am every bit as over the moon about THE WRONG GIRL as I was THE OTHER WOMAN. loving this series!!!!! and you! I searched for my older brother for years. We shared a father, his mother had disappeared with him. Years after I gave up the PI that I had used sat next to the PI he had used to find me, at a convention where they started talking cases and we both got calls. We met and there was no mixup but it was a case of be careful what you ask for - you might get it. He was a handsome, charming con man. Sometimes I wonder how he is doing now but then I think maybe I would rather not know. kateeileenshannon--wow. I would lovev to hear more. That is..quite a story. And yes, I hear so often from people who are--unhappy with what they find. Thank yo so much for telling me about that! This sounds fascinating. I have to go get this book, looking forward to reading it! I'd like to read the whole page, but the picture of Hank P. R with the news logo is blocking a chunk of the writing. My apologies to those who have been unable to read Hank's entire post due to the photo blocking some of the text. I've deleted the picture from that post - maybe that will help. It looked fine on my screen, so I am at a loss. I'm going to Hank's book signing in Colorado later this month. Can't wait to read the book, but I think I'd like to start with the first one. Please note - comment moderation settings have been activated due to spam and robo commenters. That's why you're not seeing your comments. I'm moderating them and posting them as soon as I see them. HI, all, hi all! Running in..just back from an amazing book signing..and I am on the west coast so time zones are not our friend today. Anyway--thank you all for stopping by! Thelma, that is FASCINATING! I cannot wait to read it! Will you keep me posted? Amazing. And what a terrific idea. Pstty, thank you! Are we friends on Facebook? COme find me at Hank Phillippi Ryan Author Page! Libby, how nice of you! It's fixed now! Kerry! That is WONDERFUL! SO looking forward to it..xoo and thank you! Kaye, thanks for coming to our rescue and fixing the page for those of us with a problem. Hank, both my children are adopted, one from Korea and one from Peru. I met the Peruvian birth mother, so we have information for our daughter. But the Korean mother is an unknown. Through anime and gaming my son is more interested in knowing about Japan, but he would like to know if he has any birth siblings. It would be a challenging search.